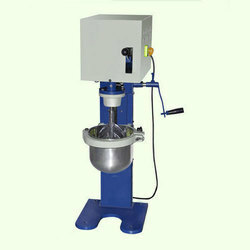 Providing you the best range of abrasion testing machine, test sieves for coarse aggregate, aggregate impact tester, aggregate crushing value apparatus, thickness gauge and length gauge with effective & timely delivery. 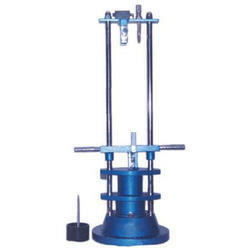 In tune with clients' variegated requirements, we are offering a qualitative assortment of Abrasion Testing Machine. 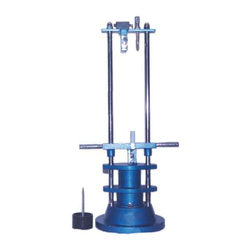 The offered machine consists of hallow cylinder that is mounted horizontally over a sturdy frame of ball bearings, this is manufactured using quality tested components and advanced technology at vendors’ end in line with industry standards. Apart from this, we offer this machine to our prestigious clients after testing them on different quality parameters at nominal prices. 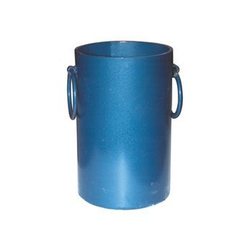 Being a noteworthy trader and supplier, we are offering a wide range of Test Sieves for Coarse Aggregate. 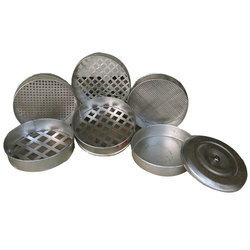 Smooth textured and easily used for lab testing purpose, offered sieves are widely appreciated in the market for its various quality features. 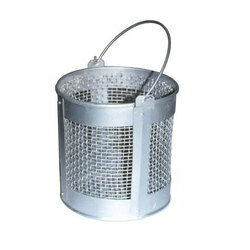 The provided sieves are manufactured by our vendors’ experts by using the best quality raw material and progressive technology in line with industry norms. Under precious guidance of our skilled professionals, we are offering a distinguished assortment of Aggregate Impact Tester. 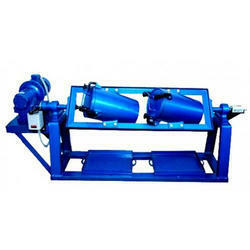 Used to determine aggregate impact value of coarse aggregate, the offered tester is acknowledged in the market due to its different quality features. Manufactured using premium quality raw material and sophisticated technology, this is tester excellent in quality. Apart from this, clients can avail this tester from us at industry leading prices. The instrument consists of a circular base with two vertical guides. The hammer of weight 13.75 ± 0.25 kg can be raised to fall freely down the vertical guides. The height of fall can be adjusted through 380 ± 5 mm. The hammer is provided with a locking arrangement. The hammer falls freely to the base and is removable for emptying. 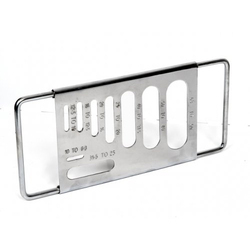 Supplied complete with metal measures 75 mm dia x 50 mm high (for specimen preparation) and tamping rod 230 mm long x 10 mm dia. With years of industrial experience, we are presenting a qualitative collection of Aggregate Crushing Value Apparatus. 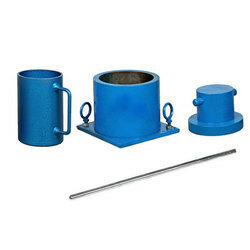 Used to measures resistance of an aggregate to crushing under a gradually applied compressive load, vendors’ experts manufacture these apparatus by using optimum quality components and advanced technology in line with industry norms. Our quality examiners test these apparatus on varied quality measures so as to maintain their quality. Moreover, we offer these apparatus to our clients’ nominal prices. 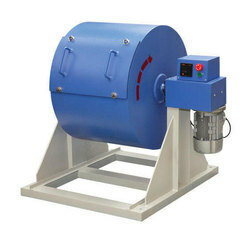 Used for determining the flakiness index of aggregates. For determination of the elongation index of aggregates. Determines bulk density or unit weight of aggregates. 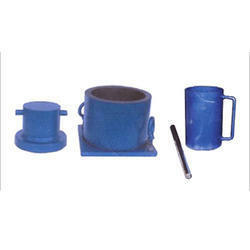 For density tests on aggregates as per procedure laid down. 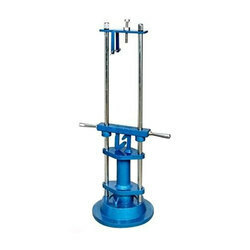 Consists of base weighing between 20-30 kg with a lower surface of not less than 30cm and support columns to form a rigid frame work around the quick release trigger mechanism to ensure an effective free fall of the hammer during test. The free fall can be adjusted through 380 + 5.0mm. The hammer is provided with a locking arrangement. A metal tup (hammer) weighing 13.5 to 14.0 kg, the lower end of in cylinderical shape, 100mm in diameter and 5cm long with a 2mm chamfer at the lower edge and case hardened. 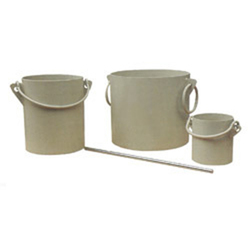 Complete with a cylindrical cup, 102mm dia x 50mm depth, one measure 75mm dia x 50mm deep and a tamping rod of circular cross section 10mm in diameter and 230mm long, rounded at one end. Electronic Balance 500gm x 100 mg / Two Pan Balance. 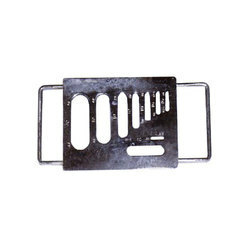 Made from thick walled Mild steel or cast aluminum. Stout and rigid to retain form and Precision machined for true measurements. Complete with handles for easy carriage. 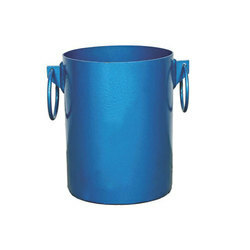 It comprises of set of two measures 20 litres 10 litres. For the determination of resistance of aggregate to wear by abrasion. Two hollow cylinders, closed at one end and provided with tightly fitting covers at the other end. The inside diameter of the cylinder 20 cms and 34 cms depth. The cylinders are mounted on a shaft at an angle of 30??? with the axis of rotation. 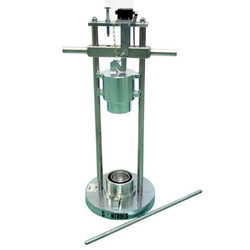 The shaft rotates at 30-33 rpm through a reduction gear, coupled to a motor. Suitable for operation on 440 volts, three phase, 50 cycles, AC supply. Supplied complete with a counter and push button starter. With 12 nos cast iron spheres or steel spheres (steel balls) hardened, approx. 48 mm in diameter, each weighing 380-445 gm. 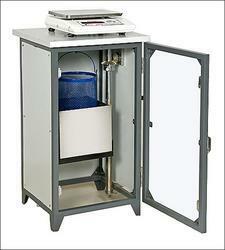 Used to determine the Elongation Index of the Aggregate. Aggregate particles are considered elongated when their length is more than 1.8 of the nominal size. 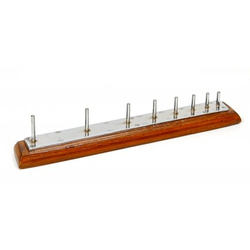 It consists of a hard wood base with vertically mounted metal studs as specified in the IS. Used to determine the flakiness index of the aggregate. The aggregate particles are to be considered flaky, if their thickness is less than 0.6 of their nominal size.